Sheppard, White & Kachergus, P.A. Legal Battle of Divorce. Can Mediation be an Option? Lucy Haeran Koh was born in Washington, D.C. She attended Harvard College and graduated with a B.A. in Social Studies in 1990. In 1993, Koh earned her J.D. from Harvard Law School. After law school, Koh joined the United States Senate Committee on the Judiciary, where she served as a Women's Law and Public Policy Fellow. She also served the United States Department of Justice from 1994-1997, first as a Special Counsel in the Office of Legislative Affairs and then as a Special Assistant to the United States Deputy Attorney General. By 1997, Koh worked as an Assistant United States Attorney in the Office of the United States Attorney for the Central District of California. She held this position until 2000. After her employment as an Assistant United States Attorney, Koh became a Senior Associate at Wilson Sonsini Goodrich & Rosati as a litigation partner, Koh represented technology companies in commercial civil, patent and trade secret issues. By 2008, California Governor Arnold Schwarzenegger nominated Koh to be a judge on the Superior Court of California for Santa Clara County. After California Senators Dianne Feinstein and Barbra Boxer recommended Koh to a seat on the United States District Court for the Northern District of California, President Barack Obama appointed her to that position on January 20, 2010. On June 7, 2010, the judge was confirmed by the United States Senate and she received her commission two days later. 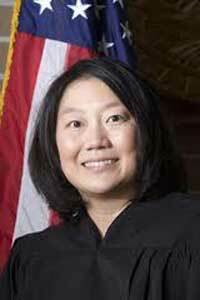 Koh is the first District Court Judge of Korean descent in the United States and she is the first Asian American U.S. District Court Judge in the Northern District of California. She is married to Mariano-Florentino Cuellar, who is a Stanford law professor. On Thursday, December 6, 2012, attorneys representing Apple Inc. and Samsung Electronics appeared in court. Attorneys representing Apple tried to persuade U.S. District Court Judge Koh to prohibit sales of several Samsung's devices and they wanted the judge to uphold the $1.05 billion jury award Apple earned in August. According to a Yahoo article, “Apple, Samsung spar in court, ruling to come,” Apple won a landmark case against Samsung in August 2012. A United States jury believed Samsung had reproduced similar features of the iPad and iPhone and awarded damages to Apple. Yahoo's editorial explains that attorneys representing the two electronic companies re-convened on Thursday. Judge Koh listened to a variety of augments from attorneys. Some of the arguments included alleged juror misconduct and putting aside the jury's verdict on liability. The hearing ended with Koh promising to rule on the issues at a later date. Lubbockonline column discusses that Samsung's attorneys want to reduce the $1 billion verdict, which was awarded to Apple. Attorneys representing Apple pleaded Koh to add millions more to the damages caused by Samsung and they want the judge to permanently prohibit sales of eight Samsung smartphones in the U.S. Lubbockonline editorial pointed out that a U.S. jury concluded that Samsung illegally used Apple technology to create their smartphone models. According to Lubbockonline, Koh did not reveal how she would rule on the sales ban nor did she say how much she would cut from the $1 billion award. Although Samsung's attorneys requested Koh to cut the award in half, she gave no clue that she sided with Samsung. The judge also gave no indication that she sided with Apple's claim to increase their award. Yahoo's article mentions that twenty-four of Samsung's smartphones have violated Apple's patents. Koh started the hearing by questioning the foundation for a few of the damages awarded by the jury. She told Apple's attorneys, “I don't see how you can evaluate the aggregate verdict without looking at the pieces.” Yahoo's column also covers Samsung's attorneys arguing that the judgment against the company should be reduced. Apple's attorneys told Koh the verdict against Samsung was reasonable. Lubbockonline noted that Apple filed a second lawsuit against Samsung in 2012. Apple claims Samsung is using their technology, but that trial will not begin until 2014. Both companies are also involved in legal battles in other countries. The editorial also reports that Apple lawyer Harold McElhinny said Samsung deliberately made a business decision to duplicate Apple's iPhone and iPad. Harold stated that the $1.05 billion verdict was a “slap in the wrist.” He also confirmed that Apple plans to keep fighting Samsung in court until the company decides to change the way they do business. According to Lubbockonline, Samsung attorney Charles Verhoeven asserted that Apple was trying to “compete through the courthouse instead of the marketplace.” The attorney believes Apple would rather battle Samsung in courts instead of competing with them head-on. The article discusses that Koh is contemplating Samsung's demand for the $1 billion award to be totally wiped out. Samsung is also waiting to hear if Koh will grant them a new trial. The company's attorneys contested that Samsung did not receive a fair trial since they were only a dozen miles from Apple's Cupertino, California, headquarters. Another argument Samsung's attorneys raised was that a juror named Velvin Hogan committed misconduct because he didn't admit he was sued by Seagate Technology. Lubbockonline editorial made it clear that Samsung is a big investor in Seagate Technology. Yahoo said Verhoeven believes Hogan should have been dismissed from the case. Samsung's attorney stated, “He should have been excused for cause. Such a juror was a juror in name only.” However, according to Lubbockonline, Koh did not comment on Verhoeven's argument. Several legal experts believe Samsung did not have an opportunity to overcome the Hogan issue since it occurred more than twenty years ago and the juror was not asked about the litigation involving Seagate Technology. Although Koh's decision can impact the outcome of this case, the legal dispute between Apple and Samsung is expected to be heard by the United States Court of Appeals for the Federal Circuit, which decides patent disputes. The United States Supreme Court could hear the legal battle between Apple and Samsung if the U.S. Court of Appeals for the Federal Circuit does not resolve the case. The advanced search option is elegant. LawCrossing is a refined website. I had a wonderful experience!! LawCrossing Fact #143: “Advanced Search” allows you to narrow down your job searches efficiently! LawCrossing is great at picking up all of the legal listings everywhere across the internet. I could have gone to three different sites to search, but you had them all on your site. That was extremely helpful. LawCrossing is a one stop shop!